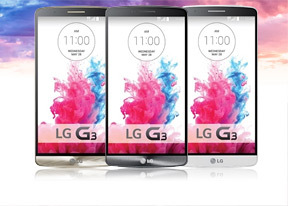 The LG G3 has a 13MP camera with a number of unique features. While the resolution and sensor size are the same as on the G2, LG claims it has enhanced light sensitivity. The camera features optical image stabilization too, OIS+ like on the LG G Pro 2. It's more valuable this year since the competition has left this one out (the new HTC One M8 dropped this feature and Galaxy S5 doesn't have it either). Anyway, Samsung made a big fuss about their phase detection autofocus and how fast it is (and it was indeed fast). LG one up them with three-pronged approach - a traditional contrast focus detection, phase detection focus and the laser focus. The Laser focus uses a setup borrowed from LG's automatic vacuum cleaners, which needed a way to accurately measure distances. It shines IR light (so not an actual laser, that's just a trade name) in the shape of a cone to get an accurate distance reading even in the dark. Note that this light is not visible to the naked eye and won't show up in the photo either. The three focus technologies work simultaneously to shave the autofocus time down to just 276 milliseconds. The IR light used for the laser focus is invisible to the human eye, but it's visible to every regular camera. Here's how it looks on video. 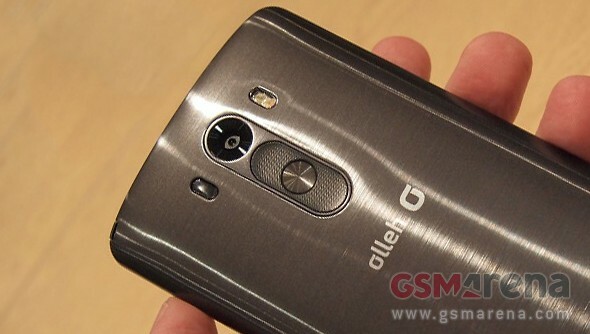 The front-facing camera shoots 2.1MP stills but LG says it has a faster lens and bigger pixels than the main camera. Low-light selfies are further enhanced by using the screen as a flash with a carefully tuned color. The camera has a 77° lens, which according to LG is the ideal for selfies. Asian countries in particular will appreciate the victory hand gesture that automatically snaps a selfie. The main camera has an actual flash, a dual-LED, two-tone flash. In terms of interface, LG has cleaned up the interface as much as possible so you only need to be concerned with framing your shot, free of distractions. You don't even need to worry about focus - since the new AF is so fast, LG decided to skip the traditional tap to focus and the phone simply gets a focus locks and takes a picture each time you tap the screen. The LG G3 camera records 2160p video. LG takes on Nokia here by focusing on an often ignored part of video recording - audio. The LG G3 features several mics, which monitor ambient noise levels and tune the sound accordingly to ensure good audio even in a loud environment. We managed to capture a few camera samples with the LG G3. Keep in mind that the unit we used was running an early pre-release version of the software and the final retail units are likely to be noticeably better. This, along with the fact that the lighting conditions were far from ideal, is why we won't be passing any judgment at the time. Instead we'll just let you check out the photos - the first of which was captured in the regular auto mode. Given the conditions, we found the HDR mode more suitable so we give you a few samples captured with it. Finally, we have a sample from the front-facing camera.